Pearls are formed inside the shell of certain molluscs as a defence mechanism against a potentially threatening irritant, such as a parasite inside the shell, or an attack from outside that injures the mantle tissue. The mollusc creates a pearl sac to seal off the irritation. Pearls are thus the result of an immune response to capture the foreign body. The mollusc coats the particle with layer after layer of a substance called nacre, or mother-of-pearl, which eventually becomes thick enough to form a pearl. 1.) Pearls are the only jewels created by a living animal. A natural pearl of value is found in less than 1 in every 10,000 wild oysters. 2.) 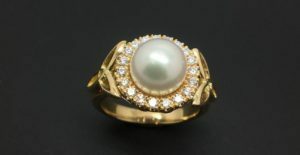 All pearl oysters are born male and transform into females at around three years of age. 3.) The earliest record of pearls as precious objects are artefacts from Mesopotamia dated to around 2300 B.C. 4.) Recently, a two thousand year old pearl was found in an Australian Aboriginal archaeological dig in Kimberley region of Western Australia. 5.) Le Peregrina (Spanish for ‘the incomparable’) is one of the most famous pearls in the world. The 500-year-old pearl is pear shaped and the size of a large pigeon’s egg. Its previous owners include a King pf Spain, Napolean Bonaparte and Elizabeth Taylor. 6.) In the early days, pearl divers regularly faced the threat of shark attacks as well as the dreaded crippling effects of the bends with every dive. In the late 19th Century and early 20th Century, the mortality rate for divers was as high as 50 per cent. Today, there are strict protocols and regulations regarding occupational diving to reduce these risks.